Aki Energy asked Boke Consulting to conduct a prefeasiblity study of biomass heating systems alternatives for the non-residential buildings on 3 First Nations communities in Manitoba—Dakota Tipi First Nation, Sagkeeng Anicinabe First Nation, and St. Theresa Point First Nation. Click here to access the full Biomass Prefeasiblity Study. What follows here is a summary of the results of that study. Each have different climate and ecological characteristics. A review was conducted of how these differences affect heat energy consumption and biomass production. The local biomass available for each of these communities was also estimated. 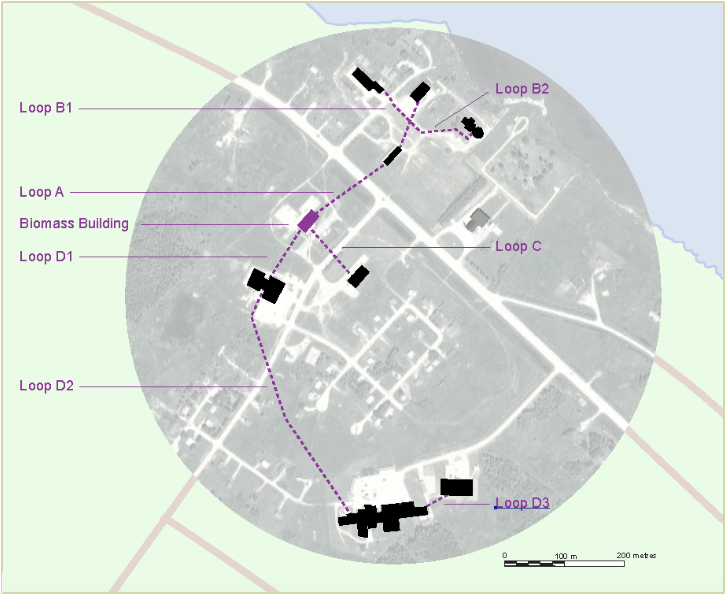 Energy consumption data was made available by Manitoba Hydro for the 4 Dakota Tipi buildings, for 9 of the buildings at Sagkeeng, and for 18 buildings at St. Theresa Point. Regression analysis was used to estimate the portion of that energy consumption that was used for heat in those buildings. The heating energy consumption of the other community buildings in these communities was extrapolated from this Manitoba Hydro data. A RETScreen analysis of each of these eight systems was conducted. Adjustments were made to the RETScreen analysis to allow for uncertainty in the estimates, and for future expansion of the District Heating Systems. If this work was seasonal, the numbers would be higher—perhaps twice as many—but only lasting 6 months each. When compared in $/kWh, the cost of heating with biomass is two to three times less than the cost of heating with diesel or propane. The cost of heating with biomass is similar to the cost of heating with grid-based electricity. Over the next ten years, because electricity rates are expected to rise faster than the rate of inflation, the cost of heating with electricity will become more expensive than the cost of heating with biomass. In the one community studied where natural gas is available—Dakota Tipi First Nation—the cost of heating with natural gas is currently less than the cost of heating with biomass. However, as the carbon levy grows, this cost difference will narrow. Depending on what happens to the carbon levy in the future, the difference in price between natural gas and biomass may disappear. The option of building a greenhouse in each community, connecting it to a District Heating Loop and heating it with biomass was considered for each community. Preliminary analysis of similar greenhouses indicate that a greenhouse in one or more of these communities could be economically viable, could create a small number of permanent jobs for First Nations members, and could contribute to healthy diets for community members. Starting with setting up 12-month greenhouses was not recommended. These require significant heat and light energy inputs and are prone to infestations of mould, fungus, and/or insects because they are warm, moist environments that never have the opportunity to freeze and kill pests. An 8-to-9 month greenhouse is a more realistic starting initiative. In addition to growing food for sale, it can be used to start plants prior to the natural growing season to support local gardeners who want to grow vegetables themselves. Each greenhouse should grow a different mix of produce. This mix should be determined by the preferences of local consumers and the length of the growing season. Greenhouses are not easy to operate over the long term. They need to be evaluated against other economic development opportunities, and other healthy food initiatives available to each community in a feasibility study customized to each community. The report makes recommendations on next steps for each community. In addition to the actions outlined below, Dakota Tipi should begin discussions with Forestry Manitoba to determine the availability of forestry harvesting licenses for approximately 250 tonnes of wood per year—ideally within 50 km of the reserve. Understanding which of these goals are more and less important will help guide the choice of heating systems. Action on this District System is not recommended until longer-term plans are in place for the use of the School. Once those plans are in place, a full natural gas consumption history of this building is required. This should be paired with a review of the original design parameters of this building, to determine if the building is operating at maximum efficiency. A review is also needed to determine if the two existing Air Handling Units should be updated with Heat Recovery Ventilation capabilities. Finally, the expected life span of the current HVAC system and furnaces is needed, to understand when (and if) system replacement is required. A feasibility study of integrating a geothermal system into this building’s HVAC systems needs to be conducted before a feasibility study of a biomass system is done, to determine which would be better. Dakota Tipi’s location means that it could operate a commercially-viable greenhouse. It could also set up and operate a greenhouse associated with the school to promote healthy living and to enrich the educational experience. Sagkeeng should immediately enter into discussions with Manitoba Hydro to determine how much line-clearing biomass material is likely to be available over the next decade in the Sagkeeng region, and if Manitoba Hydro is interested in entering into a long-term contract with Sagkeeng to harvest this material. Sagkeeng should also begin discussions with Forestry Manitoba to determine the availability of forestry harvesting licenses for approximately 1,000 tonnes per year in areas within 50 km of the community. Among other options, harvesting wood from EA132 (the 2011 forest fire approximately 50 km NE of the community) should be explored with Forestry Manitoba. The study recommends that a District Heating System for the school (and potentially other buildings) be a priority, perhaps even ahead of a District Heating System for the central community area. District systems for the north shore school and for the central community area both have merit and both are feasible, but the possibility of reducing or eliminating propane for school heating is particularly attractive. As well, the opportunity to create a new heating system of the unused former community school should not be missed. The study also recommends that the current functioning of the HVAC system in the school be reviewed and, if necessary, re-commissioned. Staff report significant problems with uneven heat in different areas of the building. This review needs to be conducted before (or simultaneously with) a full biomass feasibility study for this building. A feasibility study of creating a Biomass District Heating System also needs to be conducted for the central community’s buildings, as a second priority after the north shore schools district loop. 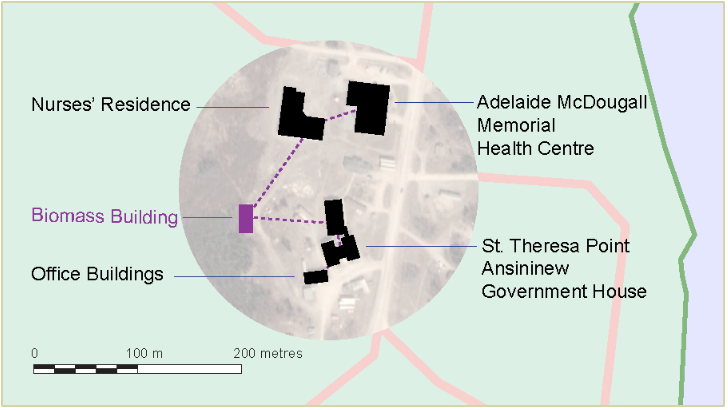 The Treatment Centre and the Health Centre are both large buildings. The Treatment Centre’s heating system is fairly complicated, and will not be as easy to retrofit as the buildings of Phase 1. The Medical Centre’s heating system is very new. Adding another heating system to it at this time may be disruptive. Sagkeeng is too far away from Winnipeg to operate a commercially-focused greenhouse, primarily designed to sell produce outside its community, that can compete successfully in the open market. Other greenhouses are located much closer to Winnipeg, and they will inevitably have lower transportation costs to bring their goods to market to the province’s main market. 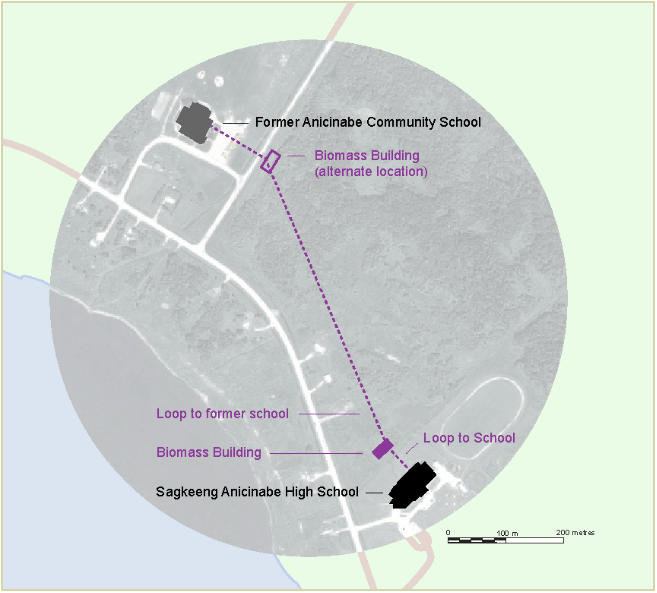 However, Sagkeeng could operate a greenhouse that was designed primarily to provide food for community members, and to support local gardening and healthy living initiatives. If Sagkeeng operated a greenhouse of this sort, attached to a District Heating System, they could also operate it in conjunction with a wood kiln dryer. Our study recommends that St. Theresa Point enter into discussions with Manitoba Hydro to determine how much line-clearing biomass material is likely to be available over the next decade in and around St. Theresa Point, and if Manitoba Hydro is interested in entering into a long-term contract with St. Theresa Point to harvest this material. A similar discussion should be started with the Government of Manitoba’s Department of Infrastructure regarding harvesting brush at the Airport. St. Theresa Point should also begin discussions with Forestry Manitoba to determine the availability of forestry harvesting licenses for approximately 1,100 tonnes per year in areas within 20 km of the community. Priority in those discussions should be given to harvesting burnt wood from the 2007 fire just south of the community (on reserve land) as well as NE112 (the 2012 fire just south of the community). 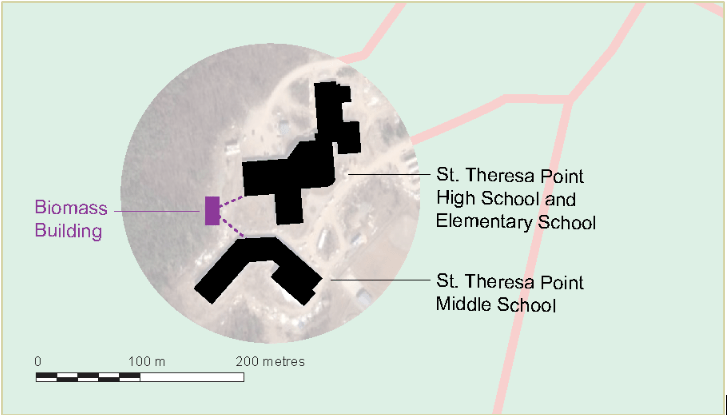 Four Biomass Systems are recommended for St. Theresa Point. All 4 of these system could be constructed. It may be best to prioritize the Medical and Governance System, followed by the Fire Hall & Garages System. Installing these systems would be relatively straightforward. Starting with 1 (or 2) systems (rather than all 4 at once) is likely to increase the chances of long-term success. 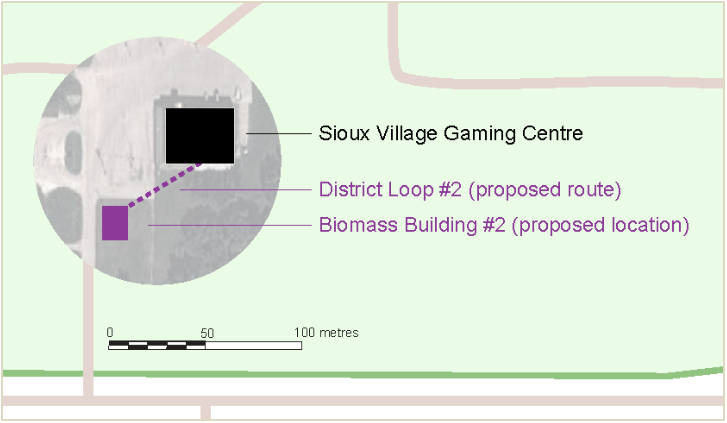 District System #1 would have three underground district heating loops branching out of the Biomass Building. The North branch would go to the Family Services and Day Care buildings. 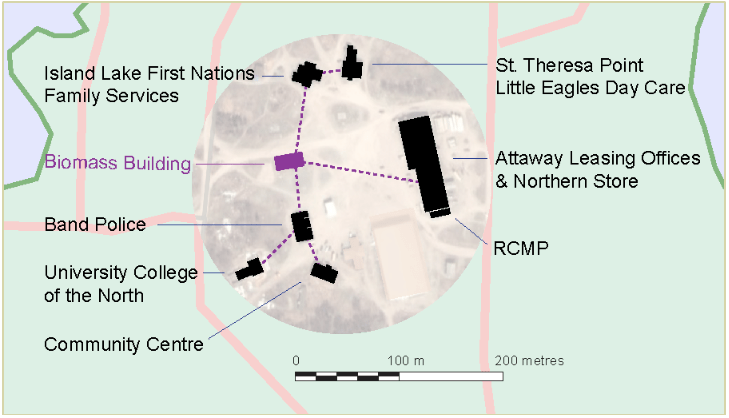 The East branch would go to the Attaway building, to the Northern Store’s heating and refrigeration equipment, and to the RCMP building. The South branch would go to the Band Police Building, the University College of the North, and the Community Centre. This entire system could be built together, or each loop could be built at a different time. If necessary, each extension of each could branch could be built at different times. So, for example, the East branch could initially go only to the Attaway Leasing Offices. If and when the First Nation (or an entity the First Nation owned) negotiated an agreement with the Northern Store to sell them heat and refrigeration services, that portion of the East branch could be added. Similarly, if and when an agreement was reached with the RCMP to provide them with heat, that portion of the East branch could be added. In order for this sort of step-by-step installation to occur, the biomass boiler, pumps, and piping all need to be sized to meet the needs of all of these buildings. This Biomass System would have two underground district heating loops branching out of the Biomass Building. 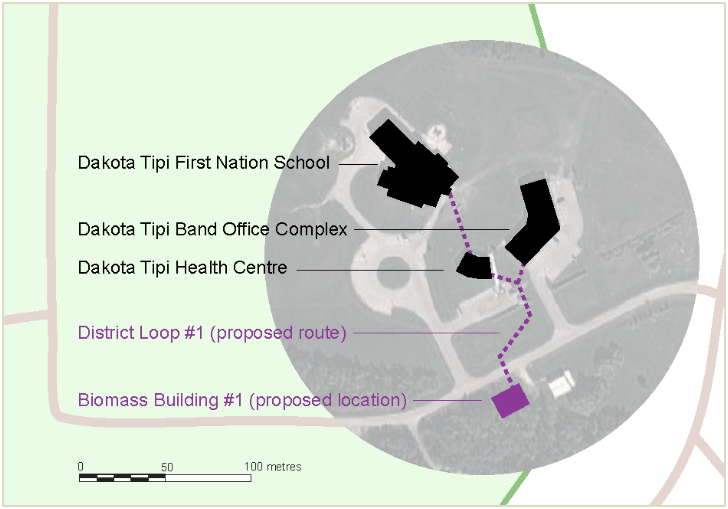 The North branch would go to the Nurses’ Residence and Adelaide McDougall Memorial Health Centre. The East branch would go to the St. Theresa Point Ansininew Government House and to the Office Buildings immediately south of them. This District System would have a single underground heating loop coming from the Biomass Building to the Equipment Garage. The loop would then branch to the other garages and the Fire Hall. The Fire Hall has a used-oil heater in it so, if there is sufficient used oil in the community to meet this building’s heating needs there may not be much benefit to adding the branch to the Fire Hall to this District System. If, on the other hand, there is not sufficient used oil, having the District System go to this building will be crucial for community safety, as the Fire Trucks need to be thawed and dried in winter after they attend a fire. The location shown above has the shortest loop requirements—approximately 50 metres to each building and a maximum of 100 metres to each building’s furnace room. If this location for the Biomass Building proves to be a problem (or if the teacherages are to be included in the Schools District Heating System) a location just to the north of the High School on the service road behind the schools may be more practical. This will not change the length of the loop to the High School and Elementary School’s furnace heating systems, but will increase the distance to the Middle School by approximately 100 metres. If St. Theresa Point were to undertake a greenhouse initiative again, like Sagkeeng, it would not be viable to grow food primarily for “export” to the larger commercial market. However, it is possible that it could provide food to the local market at a cost competitive to the Northern Store. Perhaps even more valuable, it to serve as an education venue for the school, and a source for seedlings and support to people wanting to start their own cold-frame gardens. Unlike in Sagkeeng or Dakota Tipi, cold-frame systems will be crucial in extending growing seasons for many vegetables.